The indicator ADRR was introduced in the scientific paper "Evaluation of a New Measure of Blood Glucose Variability in Diabetes" by Dr. Boris Kovatchev, Erik Otto, Daniel Cox, Dr. Linda Gonder-Frederick and William Clarke. 1)	Low blood glucose values are an acute risk. Furthermore patients with many low values will try to prevent this from happening. They do this by seeking higher overall regions. Thus they will seek higher target values or reduce their insulin doses. This tendency will likely degrade their HbA1c performance. 2)	High variability of blood glucose readings is risky in the long term. A number of studies found that, in addition to causing cardiovascular complications, cyclic hyperglycemia is an independent contributor to chronic cardiovascular disease and increased mortality. Therefore the knowledge about the glycemic variation is important to develop strategies to narrow down the variability. Conclusion: the ADRR is an interesting indicator for risks that are not necessarily reflected by the HbA1c. By calculating the ADRR monthly patients get immediate feedback how their strategies to prevent low values and high variability have worked out for them. These positive side effects of the ADRR convinced our team to implement the ADRR in future versions of the Glucosurfer. This method begins to be adopted a little in Japan. Actually, the ADRR is used together with HbA1c and make use for the correction of the lifestyle of the patient, a judgment of the propriety of drug dosage methods such as insulin, the QOL improvement of the patient. ln many countries around the world societies are ageing rapidly as medical advances and an improved living environment extend the average life span. At the same time, this has generated a marked discrepancy between actual life expectancy and the expectancy of healthy life, resulting in a complex situation in which the number of people needing nursing care has increased. lnevitably societies face as a consequence the task of preventing the decline in the quality of life of people who need nursing care. The challenge is to develop the role of dental care and oral health in creating societies with healthy longevity. Dental care should respond to the problem of increased noncommunicable diseases as living environments change and should expand its support for people who need nursing care and preventing premature death. Dental associations and other health professionals around the world are encouraged to facilitate and enhance coordination of activities to increase global awareness of and contribute to the implementation of WHO's Global Action Plan for the Prevention and Control of Noncommunicable diseases 2013-2030. Life-long oral health is a fundamental human right, underpinned by an ‘oral-health-in-all-policies' approach. an appreciation that, in order to contribute to preventing both noncommunicable diseases and a decline in oral function in old age, dental and other health professionals must create an environment that enables and encourages multi-professional collaborative practice. In "Hanadokei"(Flower clock) which Shusaku Endo, of an author published serially in the Sankei Shimbun from 1987 through 95, there is one sentence saying "only dentistry is handled with distinction". Otolaryngology and the ophthalmology belong to the medical department. Nevertheless he poses a question why only dentistry is treated as distinction. This simple question exists in the general person and medical personnel widely. Furthermore, originally, as for Endo, the dentistry should be one as a medical whole, and what place as "oral medicine" as the best specialized field of the medical whole is finally essential; say. He insists that it is social needs, and it will contribute to the healthy increase of the nation still more again. 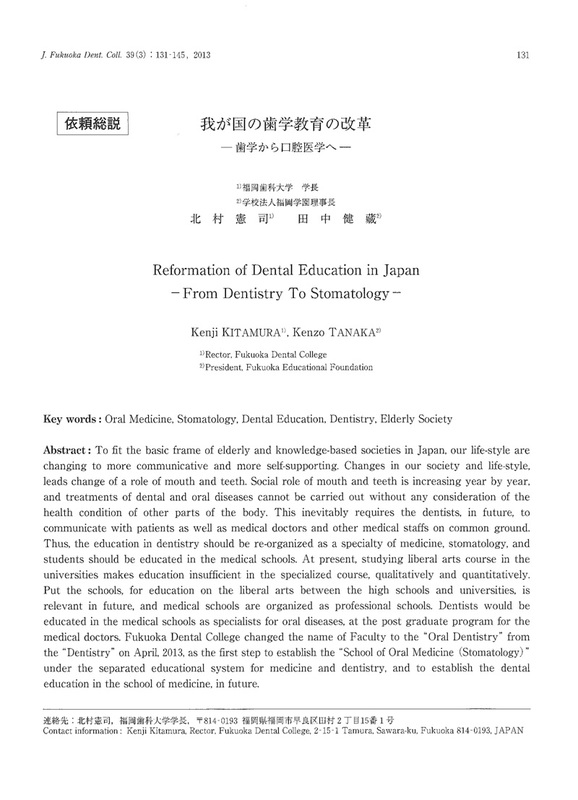 Chief director Dr. Kenzo Tanaka of the educational foundation Fukuoka dentistry school continues appealing for the reconsideration of medicine, the dental education system. The medicine and the dentistry did dual development by various society and the passage of history in Japan. In post new society including the close association between aged society, oral cavity and whole body, the dentistry has to be brought back to the origin once again. He established a study system made to a medical base as oral medicine, and it is necessary to arrange relations with the medicine unitarily, furthermore he started reorganization of Fukuoka Dental College, and he does not become and approaches it for a society, administration positively.